GLAPN (Gay/Lesbian Archives of the Pacific Northwest) will be celebrating Pride by choosing a Queer Hero for every day in June. GLAPN is interested in hearing about anybody, living or dead, or any color of the LGBTQ rainbow, whose risk, sacrifice, service, example, or inspiration made life better for our community. GLAPN solicit nominations from the community until April 15th. A committee of previous Queer Heroes will make the selections, and will announce our first Hero on June 1. 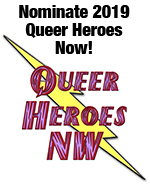 On the Thursday before Pride (June 15th), between 6 and 8 pm, GLAPN will introduce all of this year's Queer Heroes in a reception at Q Center. Please help GLAPN recognize the people and organizations that help make our lives better! Contact them at info@glapn.org. We'll also spend time with Sasha Buchert, former KBOO news volunteer and program host, now a staffer with Lambda Legal in Washington, DC. We're looking forward to Sasha telling us about the law. Music on today's show: Spacer, by Sheila and B Devotion.